Modern algal biotechnology is largely motivated by technocracy in response to food and energy crises. This biotechnological work seeks the utilization of microalgae not for technocratic ends but for a reconstruction of social practice at an ‘ecosophical’ intersection, as advocated by Félix Guattari (1989/2000) by weaving the three domains of the natural environment (photosynthesis of microalgae), social relations (digital printing), and mind (creative process of making). My laboratory-based collaboration with biochemists developed Algae Printing, which applies inkjet printing technology to seed algae on paper to grow and harness their air purification, health food, and bioelectricity applications in one compact creative system–a new concept of designing with living microbes. 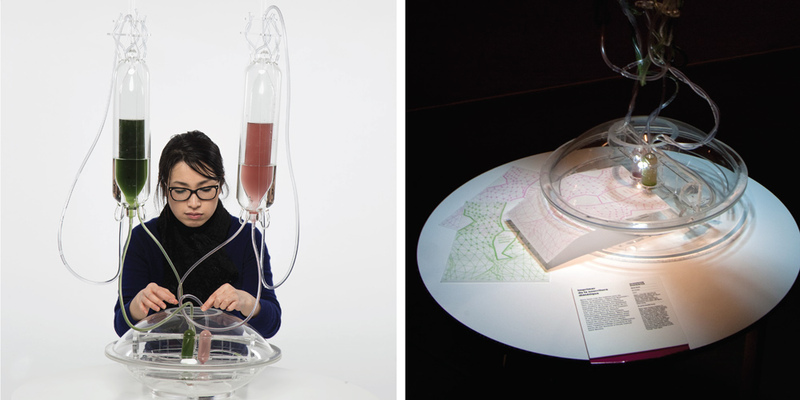 Algaerium Bioprinter is an installation contextualizing the Algae Printing technology and points towards bioindustry–an emerging development within the field of biodesign from ‘intellectual consumption’ to ‘utilitarian consumption’. Supported by the University of the Arts London: Central Saint Martins College of Arts and Design for the award of the International Graduate Scholarship 2011/12 (full-time doctoral research at CSM) and Imperial College London. Marin Sawa (JP/UK) is a London-based Japanese designer/researcher practicing experimental design at the intersection with biotechnology. She has recently successfully completed her PhD research at CSM-UAL, which was done in collaboration with Imperial College London where she is a Visiting Researcher. She has the AA lntermediate Examination from the AA School of Architecture, an MA in design from CSM, and has work experience with various architects and designers studios, including Kengo Kuma and Associates, Tokyo and the London-based Loop.pH. Her research works have been internationally exhibited and she has published particularly in the area of biodesign.